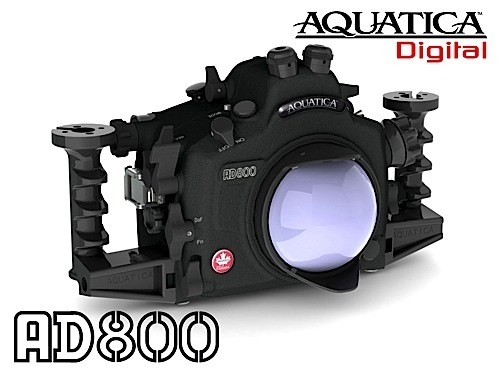 Aquatica Digital has announced a new underwater housing for Nikon D800 / D800E. The name is Aquatica AD800. The housing features access to the Fn and DOF buttons situated around the lens bayonet. These can be programmed to provide a variety of additional functions. ISO, AF Lock and AF on all get their own levers, the latter two with a rotating collar that prevents ambient pressure from pushing them. It features three ports for additional bulkheads, and there are three standard versions, one with Nikonos, one with Ikelite and the third with Nikonos and fiber optic bulkheads. The price for this underwater housing is $3,359.00. 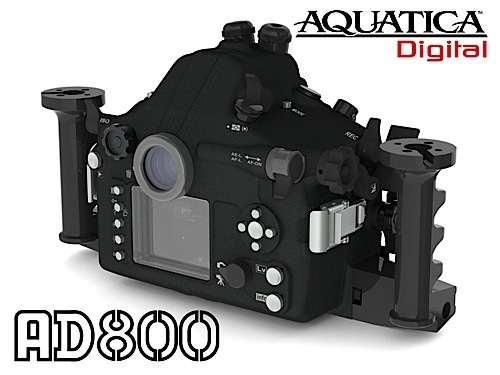 Upcoming Aquatica AD800 housing for the Nikon D800/D800e camera. The Aquatica AD800, like all of our housings, benefits from the finest material available in the metallurgic industry. It is carefully crafted from a selected alloy of aircraft grade aluminum and graced with the finest grade of stainless steel for its multiple controls. Every housing is machined on the latest 5 axis computer assisted machines. It then undergoes a protective anodizing process to the stringent North American Military Specifications. For further protection, a baked on powder coating paint is applied, this coating is as tough as nail tough. Furthermore, corrosion inhibiting, zinc anodes are supplied as standard equipment. This extra level of protection does make a huge difference as can be seen on some Aquatica housings that even with over 1,500 dives on them, still look as fresh as the day they came out of the box. This housing is made for the hard working professional in mind, one who truly understands reliability in the field. 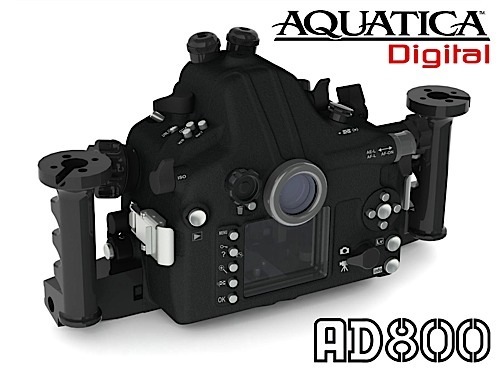 The AD800 housing a newly designed camera tray; it smoothly and precisely positions the camera in the housing and is easily disengaged by a simple push on a tab. The zoom actuating pinion gear and the lens release lever pull out to allow the user to remove the camera from the back while keeping a lens and zoom gear attached. 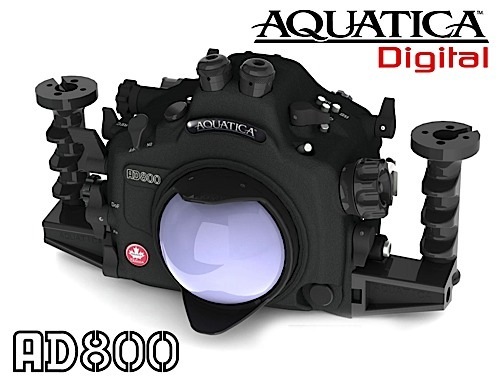 Above is a view of the business side of the new Aquatica AD800, clearly showing the serious nature of this housing. On the left hand, the buttons and mode selector control are angled and positioned for quicker access to the various functions. On the right hand the record lever has been relocated closer to your index. The Live View toggle remains within easy reach. The multi controller pad found on the Nikon D800 is made accessible with a simple and proven design and its SET button has been oversized. All push buttons are of high quality Type 304 stainless steel, the same used in the aerospace industry; these will not break or rust. Their smooth operation and position gives the photographer a very intuitive and normal feel to the housing.